Shuffle It Forward has teamed up with A BroaderWay Foundation for the fourth straight year to bring tap dance to urban communities. A BroaderWAY (ABW) was founded in 2010 by Idina Menzel, Taye Diggs and Janine Tesori (SHUFFLES parent) to offer opportunities for girls from urban communities an outlet for self-expression and creativity through arts-centered programs. The Studio @ SHUFFLES will share numbers from the showcase. In just a few short hours we create musical numbers together. But, more importantly, we create friendships and relationships. To witness two different groups of teenagers, become colleagues is empowering. “It is a great way to remind ourselves as actors how much more we have to give. Also, how much we have in common with others using musical theatre and storytelling! For two hours we get to make new friendships and get to know the strangers’ we ride the subway with. A Broader Way is an incredible organization that is lifting these incredibly talented young ladies. It is an honor for Studio and StudioAP @ SHUFFLES to be a part of this.” – Cyndi Harrod, instructor Studio & StudioAP@ SHUFFLES. Not only will ABW spend the weekend with learning and collaborating with our talented Studio & StudioAP@ SHUFFLES students, but remember all those tap shoes we have outgrown over the years? A bag of those will also be donated to ABW! 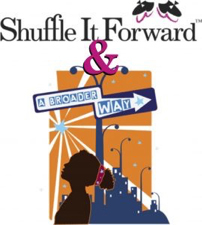 SHUFFLE it Forward, Financial Aid Fund – provides financial assistance, to those SHUFFLES families who need aid w/ tuition and costumes for the May Show.